Chris Brookes prepared some notes at the request of President John Harden detailing some of his cultural presentations from February thru May. Please see the Chrysanthemum Cultural Addendum. ECA monthly Newsletters include a “To do list” which is a compendium of the best practices of years of trial and error. If a new member or grower follows these suggestions closely and asks questions of their coach, they will end up with some excellent blooms. As a case in point, I submit Gary Budzeak. We have since learned that he sings to his plants as well as Don’s and Ronnies when he baby sits their mums. I personally believe it was “following the recipe” that allowed Gary to sweep the Novice Class at last year’s show. During our March meeting cultural discussion, Chris Brookes mentioned that some of the grower’s in England were starting some of their plants later and going with a single pinch(his notes and observations will appear in a separate post). As I skier, I liked the “idea.” By later they meant March 1st. As a club, we are trying to increase the availability of our Spiders and some of my stools were not quite ready, earlier. 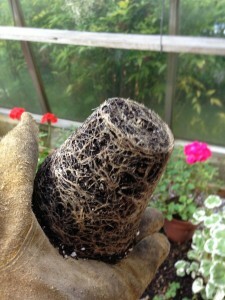 I took my last cuttings on April 16th into Peat Pots. 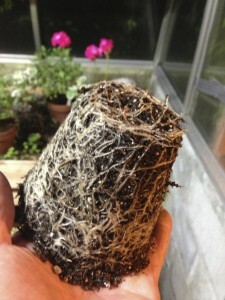 Here is #1 with some of the best roots shown going from 4″ to 6″ pot. MEETING OF THE ECA – THURSDAY JULY 11, 2013 at 7 PM at the Seattle Police Athletic Association Office (SPAA) site at 11030 East Marginal Way South, Tukwila. Come and enjoy a morning touring the amazing Bloedell Reserve on Bainbridge Island before enjoying a picnic lunch and Mum tour at the Brookes home. We need to advise the Bloedell Reserve of our numbers and pay for the tour by the July meeting latest (7/11/2013) The tour cost – Seniors $9 and Adults $13. Checks are payable to ECA and should be sent to Mark Ross, Treasurer. Detailed maps, pot luck needs and ferry schedules will be available at the July meeting or if necessary can be sent directly to individual members. FROM JOHN HARDEN – Another note on chrysanthemum white rust: The literature says that the life of the spores is 8 weeks. So we need to check our plants to see if have any new outbreaks and need to reset our vigil clock. -We will be making our last run for M&R soilless mix this month. Our next delivery will probably be in Jan. 2014, so be sure to order what you will need to carry you through this year. (You’ll need some for top dressing). Contact Don Stark or Gary Budzeak for your M&R needs. Bottles of Marathon systemic insecticide (used to control black aphids) and Ties in 4”-6”-8”-16’ lengths. It’s possible you could use some 5’ Bamboo stakes. If you would like some 5’ stakes, contact John Harden at least 5 days before the Meeting. If we have significant response we might be able to buy a bundle or two of the stakes (Typically 500) at a good wholesale price and then break them down to smaller bunches to meet your individual needs. -For Earlys (#13-15, and 23-25) Cary 4-5 laterals initially and cull back in Sept. as appropriate. 20-9-20+. Standard dosage for all is 1 tsp per gallon of water, fed once a week. If you feed with every watering you should cut the dosage to half that or less. It is common to gradually increase the dosage up to double that for heavy feeders i.e. Connies, Dukes, Jessies, Ralph Lambert, Gigantics, Harry Gees, Elsie Prosser etc. On the other side, most reds and Purples and most incurves require a lighter feeding level such as 2/3 tsp per Gal. Keep in mind that it is very easy to overfeed so be prudent. Watch and feel the leaves to gage the fertilizer needs. If leaves tend to be hard and curl up or the upper leaves turn over, you are feeding too much.